Love me some Kirby references! Syndrome, by contrast, seems to be referenced from this image that I found a deviantART. My guess is that, in searching for images of the character, this was the first one Thompson came across that wasn't posed in a menacing/manicial way. 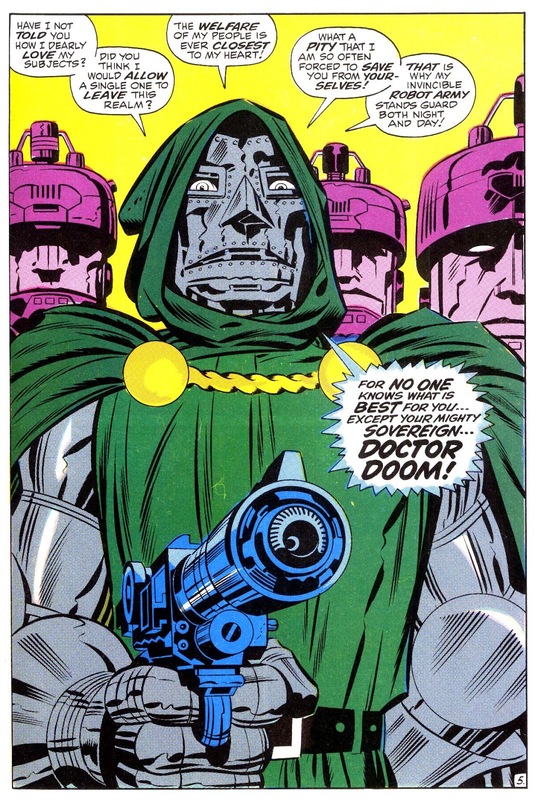 Doom is really ancillary to the joke. Any character probably could've been dropped in there, and it would still work. 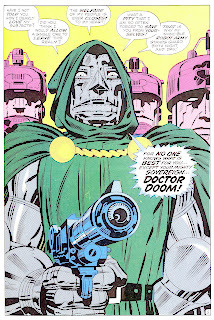 I suppose if you wanted to keep the super-villain theme, and he had to be a doctor, Doom is something of a standard go-to character in that regard. But here's the problem I have. Syndrome's costume has a giant "S" on it. Which is accurate to the character, but with him holding the "A" like he is, the "A" no longer stands there as a single vowel. It becomes part of the phoneme "sa". Had Syndrome been shown from the side or a 3/4 view, where the character is still readily identifiable, but the "S" is not shown in its entirety; or if the "A" was somewhat removed from the character, on a leash perhaps; then the "sa" wouldn't be seen and readers could more readily identify the "A" as a separate and distinct element. It's not the world's greatest joke, but not terrible by newspaper strip standards. But despite giving Doom a pair of brown slacks, I was kind of glad to see Kirby work his way into the Sunday funnies once again, even if only indirectly.